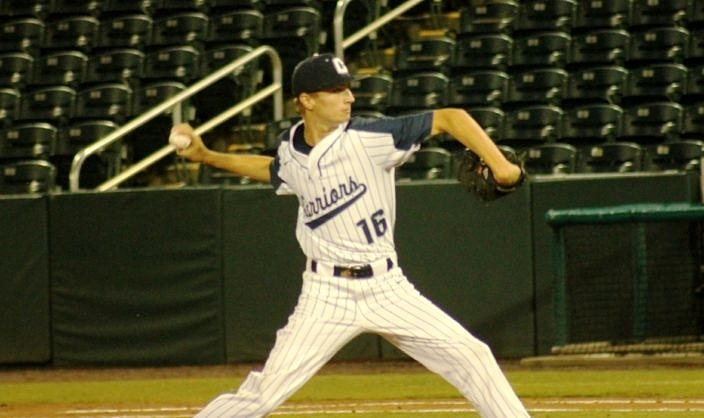 Braden Halladay made the start and took the loss on the mound for the Warriors, his first career high school defeat. Something very special happened on Thursday night. Two of the most talented and selfless baseball teams in the entire state of Florida met in the Class 4A state championship, and they both showed up flying the same flags. 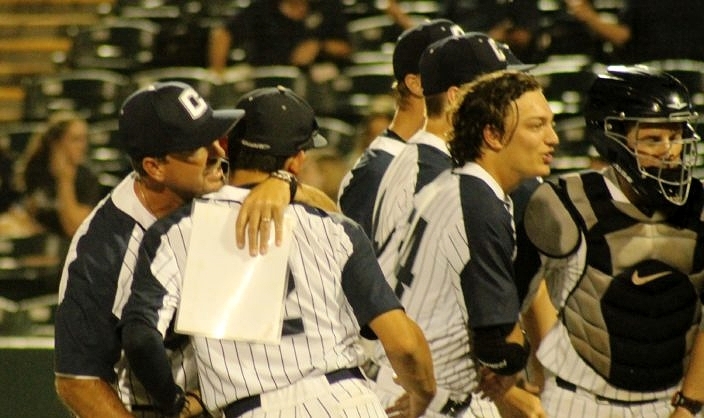 The Calvary Christian Eagles from Fort Lauderdale took on the Calvary Christian Warriors of Clearwater, in a meeting of the past two 4A state champions at Hammond Stadium in Fort Myers. The Eagles emerged 5-1 victors, writing the final incredible chapter that closes numerous storylines. The Warriors saw their two-year winning streak come to an end, while the Eagles (17-15) overcame forfeiture of numerous games earlier this season. But what mattered most was the brotherhood, that the two sides represented what they stood for by competing with all they had and then closing circled in a final prayer together. This was no civil war; this was baseball at its absolute finest. Tasked with pitching his way past a team that no hurler had succeeded in defeating in the last sixty straight attempts, Eagles junior Skylar Gonzalez delivered. The right-hander tossed a complete game while allowing one unearned run on four hits and a walk. Gonzalez struck out seven and also hit a batter. The Warriors celebrate after tagging out a runner at the plate to escape a jam in the second innig. Gonzalez had command of his pitches and was able to dictate the tempo while he was on the mound. He settled in fast and never seemed to fall out of his zone, which helped to allow him to go the full seven innings for only his second complete game of the season. The Eagles drew first blood right away in the top of the first inning. Raynel Delgado lined a two-out single to right field and Roberto Pena followed with a liner into the left field corner that sent Delgado racing all the way around the bases to score and fire up his teammates with the early momentum. The Warriors (30-1) are a team that thrives off defensive momentum, and that was the scenario that helped fuel them to their first run that tied things back up in the bottom of the third. After escaping a jam by turning a smooth, 5-4-3 double play in the top half of the frame, they got on the board when Sam Gordon lined a double past first base and then scored on a throwing error off a sacrifice bunt attempt by Eric Kennedy. Things remained that way until the top of the fifth inning, when the Eagles loaded up the bases and chased starter Braden Halladay from the game. Ben Rozenblum and Dante Girardi both singled to left, and Delgado welcomed reliever Josh Emerson with a base hit to right that filled the bags. Pena then came through again, lining a single to center field that plated two runners to give his team a 3-1 advantage. Several Warriors teammates huddle together prior to the action. The Eagles added two final insurance runs late for some extra breathing room. Delgado walked and later scored on a wild pitch, and Pena was intentionally walked and scored when Ryan Keenan was hit by a pitch with the bases loaded for a tough RBI. One of the mainstays this season has been how each player did their job when called upon. The Eagles weathered adversity both on and off the field, and it only seemed to make them stronger. 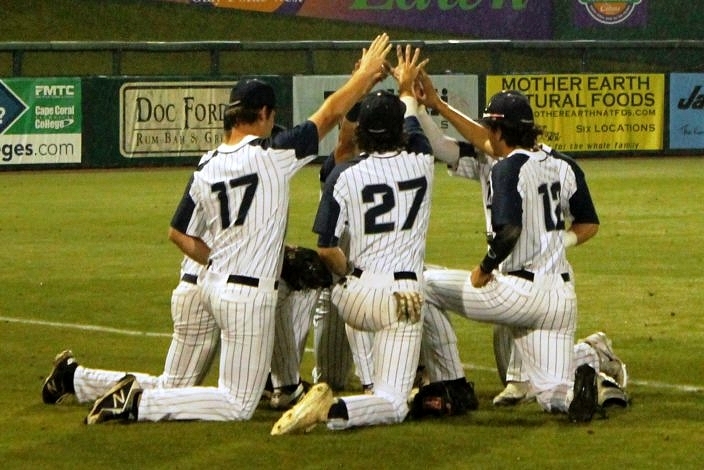 Kunkel noted how guys volunteered to go behind the plate and catch when their regular backstop was down with a minor injury, and how each player always seemed willing to do whatever was asked of him.